lincoln road: where will the kids play? The Euclid Oval on Miami Beach's Lincoln Road with its artificial turf has been a popular attraction for families with kids to take a break from shopping and dining. 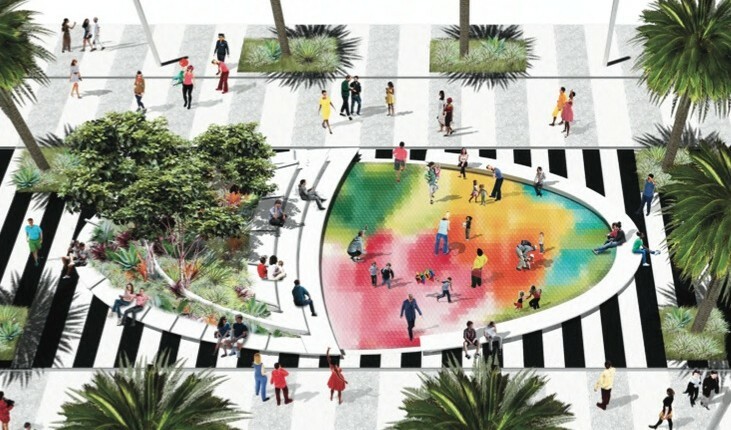 Under the new Master Plan for the iconic street designed by James Corner Field Operations, the Oval gets a makeover, going from the softer surface to a colorful tile. And that has left the Historic Preservation Board and at least one City Commissioner asking where children will play if the Oval’s character changes. But it wasn’t the colors Board members objected to. Instead, it was the hard tile surface which has a rough texture to prevent the area from being slippery. Vazquez responded, “It’s not a soft surface. It’s not a natural playground. This is something a lot of stakeholders said that perhaps it was not the right place for a playground.” Instead, the area is proposed as a place to sit and watch performances on the nearby stage or other types of events. City Preservation and Design Manager Debbie Tackett said the Master Plan involved a lengthy process of community input including neighbors, local businesses, and the general public. The proposal to use the Oval as a flexible space with seating for the Euclid Stage was a direct result of that process. Another Board member, Wyn Bradley said she would also like a softer surface for the Oval saying it’s not an inviting surface for any activity there including yoga mats or blankets for picnics or watching performances. Vazquez responded, “We don’t feel that astro turf has the qualities that it should have for one of the jewels of tropical modernism in this area.” Besides the aesthetics, the architect said using a soft surface requires a lot of maintenance and would tear easily when equipment or chairs were set up on it. Vazquez indicated the architects have about two months left on design development and will continue to think about options for the Oval. City Staff and Steinberg will look further at the option and report back to the Commission on ideas.